Trigger points are termed as hyper-irritable points in the muscle and fascial matrix, which can alter nervous system function. They are also often created by nervous system stress. Trigger points can be anywhere in the body, and can result from a local injury or from one distant from where the injury is perceived to be. They are described as hard nodules, tight bands of fiber, or “knots” in the muscle or fascia. Actually, many trigger points refer pain to a distant area – common examples are a trigger point in the calf muscle causing ankle or foot pain or a trigger point in the upper trapezius causing jaw or headache-type pain. The concept behind trigger points is nothing new. In 1942, medical physician Dr. Janet Travell coined the term based upon what she described as myofascial pain syndromes. This basically means pain derived from muscle, fascia, or both. Fascia is the thick type of connective tissue that surrounds pretty much everything in your body, from muscles to blood vessels to organs. In the 1960s, chiropractic physician Dr. George Goodheart used a similar type of trigger point therapy in his office to correct muscle imbalances. He called his therapy “origin-insertion technique” and observed that when manually treating a “knot” in the muscle or fascia that not only was the patient’s pain lessened or eliminated, but muscle strength, posture, and range of motion improved too. Stretching will not change a muscle that is neurologically facilitated (in spasm); exercise of any type will not benefit a muscle that is neurologically inhibited (weak) more than temporarily. Many hold onto this belief that either type of therapy provides healing benefits. Trigger point therapy, however, has the ability to correct these muscle imbalances and restore function, often very quickly. How Do You Treat a Trigger Point? Ideally when you treat a trigger point you’re pressing on it just hard enough but not too hard – you sorta have to get a feel for it. This can sometimes be difficult to do on yourself. You can hold a trigger point, or rub it in a circular motion (either direction), or work the trigger point in a back-and-forth direction. One method may provide a better result than another on a case-by-case basis. Apply pressure or rub out the trigger point for at least 10-15 seconds. If the pain is improving as you treat the point then continue until there is no further relief. Sometimes you can actually feel the trigger point “wash away” beneath your fingers and disappear. One main benefit for treating a trigger point is that it helps correct neurological muscle imbalances. Other therapies such as acupuncture, chiropractic and cranial-sacral adjustments, nutritional and lifestyle interventions, and biofeedback programs can also correct muscle imbalances which is vital to injury prevention and treatment. As mentioned previously, stretching and exercise-therapies cannot correct muscle imbalances; they can only alter its function for a very short period (often less than one minute). Once the neurological muscle imbalances are corrected, then rehabilitation via exercise is definitely recommended. 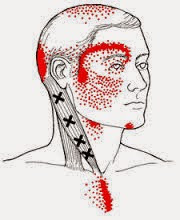 By addressing the trigger points as described, muscle fibers and connective tissue (including scar tissue) can re-align so they may begin to heal and the injured area may remove waste through improved blood flow. It is also suspected that it may help with inflammation, perhaps much like compressing an injury can be beneficial. The cause of the problem is often distant from where it is felt. This means that a problem in the thigh can be causing foot pain, or a problem in the foot may be causing a knee, low back, or even neck pain. This has a lot to do with the fascial connections throughout the body as well as our kinetic chain (how we move) – the foot affecting the knee – the knee affecting the hip – the hip affecting the back. Remember, muscle imbalances can come from everything and anything – and most often these are a result of too much stress, (including exercise training), and a poor diet. I think this is a vital point because so many people, including “fit athletes” eat poorly, are under substantial stress, and train improperly. So what happens? Well, they get injured. Then they themselves, their doctor, or therapist looks only where the injury is felt. Although this is necessary to some degree depending on the injury, you have to address the WHY, more than the WHERE. Also, the longer the injury is present, or has gone unresolved, (such as the injury you perhaps had for months that just slowly went away on its own), the greater chance that you’ll have a lot of trigger points present that you don’t even realize. That old ankle injury can easily create shoulder problems, and most docs won’t even consider linking the two together. Remember – trigger points can correct muscle imbalances and that’s how you can effectively treat an injury or prevent one from occurring. One area might respond to a trigger point whereas another area might not. If an area doesn’t respond it’s either because you’re on the wrong trigger point, you aren’t treating it correctly, (too much or too little pressure or time), or most often, that trigger point needs its source addressed – dietary, lifestyle, training, footwear change perhaps, or maybe a different therapy such as acupuncture, chiropractic, or another effective type of bodywork. Generally regarded as the most common form of massage, Swedish massage involves a combination of five basic long and flowing strokes and concentrates on the muscles and connective tissues of the body for improved circulation, relaxation, pain relief, and overall health maintenance and well-being. Swedish massage is also one of the less demanding techniques for massage therapists to practice as it usually does not involve deep-tissue work. Effleurage is the most superficial stroke in Swedish massage. It is a long gliding stroke and is most commonly used as the opening stroke in massage to apply the lubricant and assess the body's tissue while warming the muscles and skin. Petrissage is distinguished by kneading, squeezing, lifting, rolling and compression of the skin and musculature. The actions of this stroke release muscle tension and stretch the tendons providing major relief from pain and stress. Friction is typically used in deep tissue work and consists of small, deep back-and-forth movements over a local area of muscle applied by the therapist's fingers, thumbs or elbows with little to no lubricant. Tapotement is characterized by fast tapping, drumming, patting or hacking of the clients body with the therapist's hands, soft fists or finger tips. Commonly used in sports and medical massage, its stimulating effects influences the nervous system and circulatory system. Vibration or shaking tends to imitate the pulsing sensations produced by electric or battery-operated massage devices. 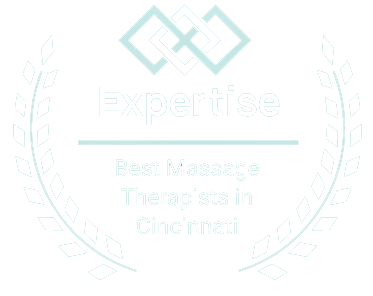 Deep-tissue massage uses slow strokes, direct pressure or friction applied across the grain of the muscles with the fingers, thumbs or elbows. Deep-tissue massage works deeply into the muscles and connective tissue to release chronic aches and pains. Its purpose is to reach the fascia beneath the surface muscles. This technique is useful in treating chronic pain, inflammation and injury. Depending on the area being worked on, a therapist may use fingers, thumbs, elbows and parts of the forearm. It helps to loosen muscle tissues, release toxins from muscles and get blood and oxygen circulating properly. It is both corrective and therapeutic. It is beneficial for many physical problems, including sports injuries and chronic pain. Because it works very deeply, emotional issues can also be addressed, when these have been stored in the body. Treatments take place on a massage table on bare skin. Deep Tissue Massage usually focuses on specific areas and may cause some soreness during or after the session. What is Fascia? Fascia is a tough connective tissue which spreads throughout the body in a three dimensional web from head to toe without interruption. Trauma, posture or inflammation can create a binding down of fascia resulting in excessive pressure on nerves, muscles, blood vessels, bones and organs. Since many of the standard tests such as x-rays, myelograms, CAT scans, electromyography, etc. 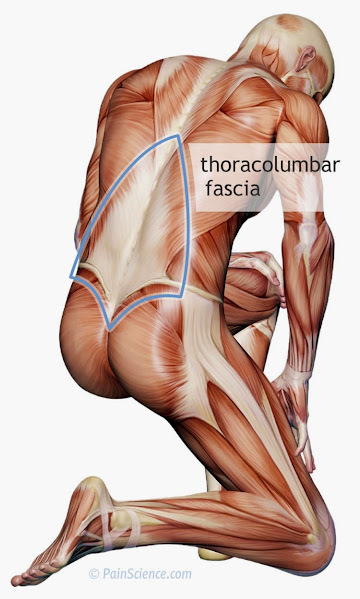 do not show the fascial restrictions. It is thought that an extremely high percentage of people suffering with pain or lack of motion may be having fascial problems, but most go undiagnosed. Myofascial release deals with the fascia, or connective tissue, of the body. The fascia is interconnected to every other part of the body, and actually helps to support the body's very structure, including the musculoskeletal system. When injury, inflammation, or physical or emotional trauma occurs, the fascia can become tight and cause pain and/or restricted range of motion. Myofascial release -- as its name suggests -- aims to release the fascia and return it to a state of normalcy by applying gentle pressure to the restricted areas. MFR can help with a number of conditions, including chronic pain, headaches, and stress-related illnesses. Eric spent years studying under legendary body work teachers Ida Rolf (Rolfing) for massage and Dr. Phillip Greenman for osteopathy where he also met Dr. Vladimir Janda who had conducted research showing that certain muscle groups got tight while other muscle groups went weak when placed under the same stress. It meant that certain groups of muscles are always involved in common strain patterns such as rounded shoulders, forward head and excessive lordosis of the low back. In order to get these patterns back in the proper alignment specifiic groups of muscles need to be strengthened while others are relaxed. This broke with the traditional model of massage which typically relaxed all the muscles when some of them actually should have been toned. Erik took the best of the three and combined the principles of Rolfing, massage and osteopathy to develop Myoskeletal Alignment Techniques (MAT). MAT works on ligaments, tendons, fascia and bones as well as muscles to realign the body. Dalton developed a method of using the bony vertebrae of the spine as levers to work on the tiny muscles in between the vertebrae that cannot be reached in traditional massage. Massages are by appointment only and can be scheduled via telephone or e-mail. I do not accept walk-in appointments. If you schedule an appointment, but do not arrive, you will be charged for that appointment unless you give 24-hour advance notice. Exceptions will be made in the case of severe emergencies. Currently, I only accept cash and checks for payment. Gift certificates are available and are mailed upon receipt of payment.